Time to get serious, boys and girls, rather far past time. Today's catalyst was the latest death of a cyclist on Boston streets. This one was Chris Weigl, a 23-year-old photographer (website up at least for now). The wreck (never call these "accidents" as though they were unavoidable fatalities) had familiar basics, as limned by the Globe report. A tractor-trailer took a four-lane right turn on a major avenue, aiming for a tiny side street by a local university. The cyclist in a bike lane was instantly mushed to death. As long as they are up, the comments at the Boston Herald let cycle haters drink their fill. The this-but-that versions will stay up at Universal Hub. This is no place to broach the craziness of all-cyclists-always-break-all-traffic-laws or cyclists-don't-have-licenses-or-pay-taxes or ban-all-bikes folk. They are beyond reason as well as compassion. Instead, Boston has started its bicycling evolution. What must be do next for safety and civility? Stop signs and traffic lights. We have to stop being puerile here and look to what has been successful in Idaho since the 1980s — rolling stops for bicycles. Stops as yields. Somewhat different but a corollary is treating red lights and stop signs as yield signs. Both of these do many of the same things. Most important is increasing safety for all concerned by taking into account the huge differences between bikes and motor vehicles. Two emotional responses to overcome are ingrained but not immutable. Most drivers here love the dumb cliché promulgated by the likes of Mass Bike, the barely logical same-road/same-rules chant. The anti-biking types like it as a weapon to pull out and slug cyclists with for any real or perceived infraction of a traffic law or regulation. There are two underlying pretenses here. First, all cyclists are total scofflaws and all drivers are absolutely law obedient. For the latter, I have yet to follow a driver for more than 10 miles without observing violations, such as changing lanes without signaling, failure to yield to pedestrian in crosswalks, not coming to a complete stop for a light for stop sign and before the marked line, stopping on a crosswalk, exceeding speed limits, passing through an intersection after the light changed red and on and on. If all traffic laws were evenly enforced, a tiny percentage of drivers would retain their licenses. Yet that does not prevent most of living in a fantasy world of reckless cyclists and virtuous car drivers. The second is more childish and visceral. The sense that even if a change in law is for the safety of all, anything that gives a right to a two-wheeler that a four-wheeler does not have is morally wrong, damn it! It's the three-year-old's wail of "She got an ice cream and I didn't!" To the same-rules bozos, I have little but disdain. We can easily observe and surmise myriad differences. Cars can drive on interstates and other limited access highways. Bikes can travel bike paths and lanes. Drivers must signal before every turn or lane change, cyclists when it is safe to do so taking a hand off the bars. Cyclists can dismount and use a crosswalk. It goes on and on. More significant are physical differences. 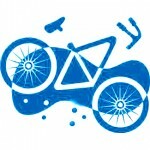 A cyclist is hard pressed to hurt or kill anyone, but doing so is built into the one to three ton motorized vehicle. A bike can stop at speed in only a few to 25 feet, long before a driver can move a foot from gas to brake. Even then, a car or truck total stopping distance is in hundreds of feet. Likewise, a bike has the same tiny inertia leaving a red light, so it can be into or across the intersection before a driver can give it gas. These and many other differences beg for reasoned nuance in laws and regulations. Yet both driver gut responses of these are so real, and both so enabled by the lunacy of same-road/same-rules that any improvement has to deal with them. Unfortunately for humankind, about half of us seem very literal minded, like rules-are-rules bureaucrats. They need extra care and attention on any topic. I can remember when I first introduced the stop-as-yield law and testified before the MA Joint Committee on Public Safety and Homeland Security hearing and sensing that is-this-fair attitude from the senators and reps. My proposed law, dutifully introduced by my then Rep. Willie May Allen, would indeed have granted cyclists an option motor-vehicle operators would not have. I explained how as a multimode guy — car, T, ped, bike — I was aware how nervous and thus dangerous drivers were when they were beside a cyclist at a light or red octagon, when it was time to proceed. On the other hand, when the cyclist leaves first, the driver overtakes the two-wheeler and feels in control. The driver doesn't worry about the car's width or where the bike is. I could feel the progress but also those present would need to hear this more than once. I didn't think there was a cyclist there other than I. This must be what folk used to this process have told me, that you need to introduce a bill three to five times and make your arguments each time to get it through. Meanwhile, the pros here, bike czars in major cities here and in Europe, concur that presence equals awareness. As we get more cyclists on the roads, drivers gradually accept that they are sharing the road not only with pedestrians, trucks, buses and trolley, but also with cyclists. Wish as they might that all the others would disappear, they come to accept that they're all there forever, like mosquitoes. They learn to deal. When they do that, they are less likely to do thoughtless maneuvers that can bring death and dismemberment. This process has one great accelerator, enforcement. If you read the Herald anti-bike comments, you'll see one-sided calls for that, as of course, drivers are always blameless in any wreck. Cyclists need bike licenses, need to pay cycling insurance, and most of all need a cop on every block to ticket them for their incessant law breaking. Those multimodal types among us, including me, snort in their general direction. If virtually any driver were ticketed for every infraction large or small, none would take a trip to the grocery or flick without multiple tickets and perhaps a trip to jail. Instead, I have to agree with the rules-are-rules types here, but for everyone. Ticket and even tow the bad guys! Pause here for the self-pitying and self-righteous keens of cops. Oh, Lawdy, no. "If we have to enforce traffic laws for drivers, that's all we'll do. Murderers, thieves, and dealers will rule the streets!" That's the most flammable of strawmen, of course. In the real world, when cops or umpires or any enforcer does the job, it's short term. If local police enforce the laws, words gets around quickly and drivers even cyclists would show some restraint and sense. Then cops can go back to pretending they are serious crime fighters. Boston is infamous as a city where the police live by the no-blood/no-ticket model. They hate paperwork and are insulted by the $1 jaywalking tickets, the $20 cycling ones, and other pissant enforcement. They can go decades or whole careers without a felony arrest, foot chase or detective-level investigation, but they love to live the fantasy. Any moment, their duties will call them to major crime busts. That melodrama can't continue to interfere here. The local commissioners, supers and unions have to know that public safety is more than a bromide. Enforce the damn laws for a couple of months. The citizens will get the idea and straighten up. Let both drivers and cyclists (hell, peds too) be afraid they'll get hauled away and maybe financially ruined if they cause injury or death. Make it certain. Let them sweat for a few months. They'll adapt and we'll all be safer and saner. By the bye: I'm overdue for reintroducing my cycling bills and testifying. Cross-post note: This appears in Harrumph.